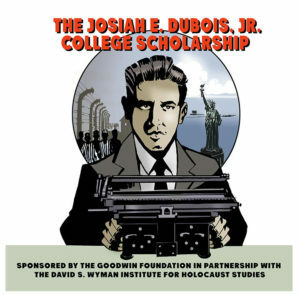 The Josiah E. DuBois, Jr. College Scholarship Essay Contest seeks to bring attention to the courageous actions that DuBois took during the Holocaust. This contest offers high school students an opportunity to win a monetary award to be applied to their college expenses. High School seniors enrolled in a U.S. accredited high school program, including home-schooled students. Only one entry per student. Write an essay that describes how you have applied or would apply the lessons of the DuBois story to your own life, focusing on core values such as decency, honor, and respect for our common humanity. The essay should be 500-1,000 words in length. QUESTIONS TO CONSIDER, ALTHOUGH IF THERE ARE OTHER ISSUES THAT INSPIRE YOU, WRITE YOUR ESSAY AROUND THOSE. —How has the life and work of Josiah DuBois inspired you? —What can teenagers do when human rights are violated, in one’s own country or abroad? —Do you think if someone accepts a job in the government, he or she should follow their boss’s instructions, even if they disagree with them? —How do you balance moral and ethical considerations with job issues that contradict what you believe to be the correct course of action? —What is a person’s obligation to help a stranger? Each is a one-time award, for use in the 2018-2019 academic year only. —Application deadline: June 15, 2018,11:59 PM EST. —Winners to be announced: No later than August 15, 2018. —Awards to be distributed no later than September 25, 2018 upon proof of enrollment and tuition payment. —Your essay must be typed and double-spaced. Statement by the student affirming that the essay is original and unpublished. The decisions of the judges are final. Notification will be made by email, to the winning students and their sponsoring teacher only. 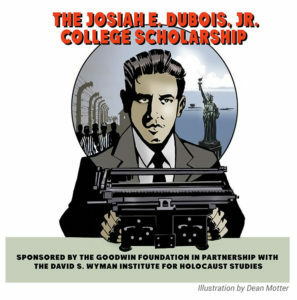 Winning essays will be published on the Goodwin Foundation/MEPDN website and the website of the David S. Wyman Institute for Holocaust Studies. The Goodwin Foundation/MEPDN and the David S. Wyman Institute for Holocaust Studies reserve the right to use the winning essays for future publicity purposes; to change the date of the application deadline if circumstances necessitate such a change; to refrain from distributing awards if in the judges opinion the submissions do not merit them. Cash awards may be deferred for one academic year if the winning student is participating in a gap year program.